Last year's number are in parentheses. A fantastic new filler game, Dominion's numbers only inflate if you add the expansions (listed below) which we got late in the year. I'm fairly sure it will be a quarter next year, as well. Sad to see only two dimes, and both of them short card games. The Magic sessions included several 45 minute drafts. I expect Magic to continue next year, and every year for the foreseeable future. R-Eco is a nice game, but it could easily show less plays next year in favor of better ones (such as Parade). More light games. It's Alive will continue to be played, of course. ToC is in the same boat as R-Eco: a nice game, but an easily replaceable filler. Stone Age is somewhat meatier; the group enjoys it (I enjoy it, but not as much as they do). Finally some of the meaty games. Agricola is very hefty, and a good game experience. But it's very hefty. I love Antike, but some of the others in the group don't like it as much. I'm surprised at the poor showing of Bridge, but Tichu tends to eat into its play space. Fair Tale was acquire with a trade for Saboteur, and I think both of us are happier for it; it's light, kind of random, filler game. Pillars of the Earth is a nice worker placement game, but several other games are now competing against it, including Tribune, Stone Age, and Endeavor (yet to be played). Puerto Rico is The Game, and will always be around. RftG expansion can be combined with the base game for play total (see below). It was played five times straight on Games Day. Chess only gets played during special events, such as by newcomers on Games Days. YotD competes with other mid-weight games, especially Notre Dame (below). Cosmic is a classic, but a strange kind of strategy game, and so doesn't come out too often. Notre Dame now competes with Year of the Dragon and other new games. Pivot was a prototype played only during a Games Day. Power Grid didn't see as much play as I expected, but should continue to see some play next year. Bridge Troll and Taluva are decent games, but didn't grab the group's interest. Bridge Troll I traded away; Taluva will likely share that fate next year. Jamaica is a good, not great, game. We played Pentago one game evening by request; it's not that deep of a game, but good for non-gamers. Princes of Florence is still a great game, and likely to see play next year, still with low numbers. San Juan seems to have lost out in favor of RftG; it really needed to have an expansion made for it soon after it was published (there is a mini-expansion available now). Amun Re is not stored at the group, and so sees less play than it probably would otherwise. Amyitis was brought to us by Binyamin, and I picked up a copy late in the year. One play of it by some new players wasn't successful. I hope to bring it out again. Jambo is a fluffy filler for two-players. LotR:tC is a better filler for two players. La Citta and Santiago are two meatier games that are good, but typically not chosen as first choice. Settlers of Catan is The Game for new players, but not played much by old-timers. Some people would like to play it more. Parade is not yet available outside of Germany, so we used a Sticheln deck to play it. It's a very good filler. Apples to Apples is a party game, only played on special occasions with the right group; not a game generally brought out to the strategy gaming club. Ark of the Covenant was brought by a one-time only attendee who wanted to learn how to play it; it plays similarly to Carcassonne: Hunters and Gatherers. Nice. Atlantic Star is not a favorite of the group, though I think it's quite nice. It's biggest problem is it's reliance on a crayon to write values. We tried Carpe Astra, didn't like it, and traded it away. Claude is a prototype someone brought for us to play. We only got Dominion: Intrigue late in the year, so it's play count will go up. Fluxx is only played when I'm away, thank goodness. Mr Jack is a nice, meatier two player game, for when Lord of the Rings: the Confrontation is not long enough. No Thanks is a nice, quick filler for up to five, but Parade is also good for this spot. Path was an ok abstract which I traded away. RftG is enjoyed by several in the group, but with its expansion now (see above). Shadows is a good cooperative game; I find it a bit straightforward. It can take a lot of players, who can come and go without disrupting the game flow. I love Trias, but haven't gotten others to love it, yet. Vegas Showdown always surprises us as to being a good game. We played it to see if we wanted to keep it, and we did. Age of Steam is awesome, but long; I just got the slightly lighter game Steam, at the end of the year. Battlestar Galactica is another good coop game, which will probably see more play than Shadows Over Camelot, if a cooperative game is called for. It's also pretty long, however. Blokus Trigon is lighter than the usual fare played, but I think it's an excellent game, especially for new or non-gamers. Boggle is not usually played by the group, except on a lark; we don't play word games. C:H&G was traded away in favor of Carcassonne: Cities (which didn't get any play). I need to introduce it to new players; the older players are not enamored with the Carcassonne series, for some reason. Caylus is too long for my tastes, and the game tends to play you; others like to play it occasionally. Checkers was played on Games Day by transient attendees. Cities and Knights was played by newer players. I still like it, but only if you add a rule that the game ends once a player is 5 points ahead of any other player. We played Cuba once, and have to explore it a lot further. Dominion: Seaside will also see more play next year. Dvonn is a great abstract that doesn't see enough play. I'm shocked to see El Grande only at one play, but it's also a pretty long game. Someone brought Galaxy Trucker while I was away, so I can't comment on it. greedy Greedy is a variant of Farkle which someone wanted me to review; traded away. Hacienda is an ok medium-weight game, but not good enough to keep. Hare and Tortoise is a nice, friendly game; not sure how much play it will get next year. Homesteaders was played once by some of the others, who called it fiddly; it looks like a great game to me, and I hope to try it out. Imperial we either played incorrectly, or it's just not for us. Le Havre is fantastic and should see more play next year. Louis XIV is a good game, a little annoying at the end, but a good medium weight. Not sure how much play it will get next year (probably 1 play, again). Market was brought over by Binyamin; the players liked it enough, but no one asked me to buy it. Medici is a good auction game, but straight auction games always feel a little empty. Everyone hated the Dutch auctions in Merchants, so we traded it. Binyamin also brought Metropolys, with the same results as Market. Odin's Ravens is a fluffy two-player game. One play of Phoenicia which we all liked. Pirate's Cove has too many dice for some people; oddly, I like the game. Pitchcar is not a strategy game, but was brought over for Games Day. Michael insisted on playing RPS on Games Day. Rook is a nice partnership trick-taking game, in the same space as Bridge and Tichu. Taj Mahal is an old club favorite, now pushed aside by all the other games in the same weight category. It's a scandal that T&E only got one play. Tribune is an excellent worker placement game, sure to see more play. Winner's Circle is fun for non-gamers only, and I traded it away. Yinsh is another excellent abstract, which sees occasional play as a filler. Played last year, but not this year. Alexander the Great (1): It was boring. Arkham Horror (1): Too long. Before the Wind (2): Flawed. Blue Moon City (1): Good game, but brought by Binyamin. Dungeon Twister (2): We're not a FFG group. Go (3): Adam didn't come that often this year. Havoc: the Hundred Years War (3): Not really a gamer's game. Industria (2): Good, but not good enough. Netrunner (1): Damn. I think I'll end up trading these away. A pity. Robo Rally (8): Great game; one of our regulars hates it. Might see some group play again this year. Saikoro (4): I wouldn't mind playing this quick game on occasion. Two Religious Jewish Weddings. Really. This is the tale of two religious Jewish weddings, one from the far, far right (Belz Hasidic) and the other from the far, far left (Conservadox). Both of the weddings followed halacha (Jewish law) - kind of. The Hasidic wedding adhered to halacha and a whole lot more, adding strictures and stringencies to separate the genders as much as possible. The Conservadox wedding adhered to halacha, but used the most lenient and minority opinions it could find to equalize the genders as much as possible (and went a few inches over those opinions). The Hasidic wedding added a number of customs that were developed over the last few decades and centuries, but which, they claim, go back to the bible. The Conservadox wedding jettisoned several well-known customs that originated in the last few decades and centuries, because the couple didn't feel that they engendered a sense of equality. Both of the weddings were rather odd compared to the more usual religious weddings I've attended in my twenty years in Israel. The bride and bridesmaids before the wedding starts. The bride is already wearing a sheitel (wig). In modern religious weddings, the bride doesn't cover her head with more than this bridal headpiece until she leaves the wedding, after which she might wear a sheitel, hat, snood, tichel, or whatever. The father of the bride (front), Rachel (looking at camera). The bride's family is Conservadox; their daughter became Belz Hasidic over the last few years. The signing of tenaim and ketubah. The tenaim are extra marriage agreements, a custom of certain Hasidic groups which has infiltrated to a minority of modern Orthodox congregations, as well. The hall was sparse and utilitarian. I've had good, even fantastic, food at Haredi weddings; the food here was abominable (sorry, guys, we love you anyway). The music was loud but good: two great singers singing in harmony, one drummer, and one guy operating a music computer system (all men, of course). The ketubah text is traditional, and specifies the husband's obligations to the wife, and sums to be paid upon divorce. Unfortunately, in Israel, the ketubah is generally ignored by both religious and secular courts (the wife is assumed to agree to waive its contents). The wedding was held outside, after dark. The parents held candles. Here comes the bride, assisted by her mother and soon-to-be mother-in-law. In a modern religious wedding, the bride typically has double translucent veils on her head, both veils behind her head until the badekken. At the baddeken, the groom then takes one of the veils and places it over her face. Under the huppah, the veil stays over her face until the second cup of wine is sipped, at which point the front veil is moved behind her head again. Here, the bride's face was covered with what appears to be a thick cloth napkin, or perhaps a small tablecloth. This covered her more than a burqa would have. For all the groom knew, anyone could have been under there. She couldn't see. A wide series of hoops in her skirts completed the effect by making her unable to walk without tripping every few feet. The bride circled the groom seven times. The groom kept his eyes closed during the badekken, except for a brief flash before he tossed the napkin onto her head. He kept his eyes closed, fervently praying, during the entire huppah. Likely the bride did the same. Stamping the wine glass, in remembrance of our broken temple. The groom gives the ketubah to the disembodied hand of the bride. The dancing after the huppah is usually full of joy and happiness, as it was in this wedding. Under the huppah is usually joy mixed with holiness. Under this huppah, there was holiness, but no external expressions of joy. The Rabbi intoning the last traditional blessing - which includes the words "... Who creates joy and happiness, bride and groom, gaiety and gladness, rejoicing and jubilation, love and comradeship, peace and affection ...", and is usually accompanied by singing from the audience - made the blessing sound like an anguished prayer for forgiveness. The bride emerges from the veil after the ceremony is complete (wearing a sheitel, of course). Off to the dancing! The location: on the shore of the Dead Sea, with traditional Moroccan furniture and fixings: elaborately tiled walls and tables, hand-sewn cushions, and Tangeen pots. All the food was vegan, and very good (although pity that Moroccan's don't know about chocolate). The music was somewhat anemic (sorry, guys, we love you anyway). Father and brother of the groom. Groom and bride before the wedding. The usual custom is a white wedding dress for the bride, and a kittel or white over-garment for the groom, symbols of purity (not virginity, as it is for Christians). The white wedding dress was discarded, I'm not sure why. They might have felt it was sexist, for some reason. Traditionally, the bride and groom don't see each other before the wedding. Much of the wedding party, before the wedding. A woman cannot force her husband to divorce him, unless she can prove something about the husband that should have been revealed to her before the marriage (such as a lame leg, or infertility). If a husband refuses to let a woman get divorced, she is "chained" to him, a status called "agunah". In contrast, a husband can divorce a wife for nearly any reason; in modern Israel, however, the courts will not give the divorce against her consent. A husband can get around this by taking a second wife (in certain communities this is still legal) or by gaining signatures from 100 respected Rabbis. Many people feel outraged by this discrepancy in the modern world (I'm one of them), but changing the system within the framework of halacha is tricky. One possible solution is in the form of a carefully-worded pre-nuptial agreement, such as the one they are signing here. Their doing so, as they announced while doing so, was also meant to encourage others to take the same step in the hopes of eventually establishing parity in the laws. The huppah, hand-sewn by 75 of their friends. Patches include those for the struggle in Darfur (an issue about which they work to raise awareness), love of Israel, and so on. No aisle. No baddeken. No veil. No circling the groom. The bride and groom held hands. The groom gave a ring to the bride, as "eirusin". Then, for "kiddushin", the groom accepted a ring from the bride as a symbol for agreeing to the terms of the ketubah (which was slightly modified from the traditional text in certain ways). They broke a cup in remembrance of the temple. Women and men both recited the traditional blessings under the huppah (according to the the booklet that they handed out before the ceremony, the extreme lenient opinion allows for women to make the traditional blessings only at the wedding meals, not under the huppah; I'm not sure how they justified this.) The blessings were repeated in both Hebrew and English (the English served as a translation). The couple, right after the ceremony. Minority opinion allows a married woman to go with uncovered hair. Off to the dancing! There's a fantastic children's game called Froggie Boogie. 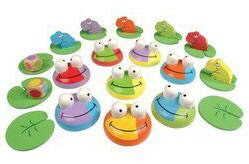 The game comes with a lily-pad track, a small frog for each player, eight larger frogs in two colors each, and two eyes for each frog. A fly is pictured on the bottom of one of the eyes on each frog; the other eye has a blank bottom face. On your turn, you roll the dice. The two colors rolled on the dice indicate a specific large frog. You choose to look at the bottom of one of the frog's eyes. If it shows a fly, replace the eye in its place, move forward on the lily-pad track, and go again. If it shows a blank face, replace the eye in its place and pass the dice to the player on your left. The first player to reach the end of the track wins. At the start of the game, picking the eye with the fly is a matter of luck. However, you should, in theory, always be able to pick the correct eye once you've "done" a particular frog. In practice, you tend to forget, again and again, which eye has the fly, much to the amusement of your children who win at least as often as the parents do. It's a fun game for kids, or for kids to play with adults. About halfway through my first game of Froggie Boogie, I realized that the game is solvable. I could assign an order number to each frog, and a binary bit to each eye (for example, right eye is 0, left eye is 1), and thus, after every play, adjust the value of the bits in order, convert the binary number to a decimal number, and remember the decimal number. On my turn, reverse the process to determine the correct location of the fly. I could have ... but I didn't. Instead, I continued to play the game the way I believed it was "meant to be played": I tried to remember the locations visually. I got better as the game went on, but continued to make the occasional mistake. In turn, my memory got some exercise. Why did I do it this way? Because using my solution would have been cheating. On the one hand, it wasn't against the rules. On the other hand, it was against the spirit of the game; solving the game wasn't what the game was "about" . It wouldn't have exercised my memory. And it would have made the game phenomenally boring for me, and for all of the other players. In other words, it would have taken a fun game and turned it into a waste of time. That's wrong. In a competition for $1,000 or a trophy, one is expected to try to win at all costs, so long as one plays by the rules and exhibits sportsmanship; in this case, my solution would not be cheating. In a family situation, there is a limit to how many personal resources you are expected to bring to bear in playing a game. You don't go all out against your four year old while playing tennis. You give a weaker player a handicap while playing Go or Chess. That makes it fun for all players, and that's the point; winning is besides the point. In some games, information is hidden but trackable. For example, in Puerto Rico, you are aware of how many victory points a player gets when he or she gets them, but you are not "supposed to" keep track of exactly how many each player has . In It's Alive, you can track how much money and which tiles each player has, if you really want to. But you shouldn't. You should guess; it's part of the game. If I had wanted players to keep exact track exactly how many coins and which tiles each player had, I wouldn't have given each player a personal screen to hide them. Exactly keeping track of this information slows down the game, and also makes the game a little boring. Over-analysis of a game situation may lead to better results, but it leeches away the fun and the game time from others. When you over-analyze, you get more play time than the other players do, and you may even prevent an additional game from being played later in the evening. Over-analysis is spending 1/6 more time taking your turn than the average time spent by each other player taking his or her turn. If everyone else spends, on average, a minute to think through a move, you should spend no more than, on average, a minute and ten seconds. You may do better for thinking longer, but that's not the point of this particular game. You are expected, in this particular game, to think only so far, and estimate the rest by instinct. Thinking for up to a minute or two should be able to get you to take the path with 33% chance of success over the path with 1% chance of success. If several more minutes of thinking gets you to a path with 55% chance of success, then you're over-analyzing, or you're specifically using the game to think through a particular type of strategy [1, 3], or you're playing Chess, where each player's turn is long and deep thinking is encouraged. Froggie Boogie's game play is simple, light, and fairly quick. Its child-friendly theme acts to discourage playing the game in any way other than the canonical way. Same games have open information; this makes tracking information simple, but additional concrete information can lead some players to additional over-analysis. Some computer games and some board games prevent over-analysis by not providing you a lot of options, or by providing you many options, or by not providing complete information. Providing few options results in a narrower, but possible deeper, search tree. Providing many options results in a search tree that is so broad that anyone with sense should quickly realize that a complete analysis will take too long. Incomplete information is not much of a help on its own, if players can still work hard to analyze the odds. Many computer game, and some board games, prevent over-analysis by requiring you to make your moves under a time constraint. You can institute your own time constraints (an hourglass or a kitchen clock works well) for any game, if you so desire. These sentiments do not apply for all occasions. For example, solving the game might serve as an instructive exercise for a class in math, logic, or algorithms. In a two-player Puerto Rico game, you can't help it, since you know how many you and the bank have, and you know how many there were to start with. To solve this, the bank's current total should be kept secret. Use twenty five 1 VP chips, and the remainder 5 VP chips. Place the 5 VP chips beside the board, and the 1 VP chips in an opaque bag. When you gain 1 VP chips, take them from the bag, tossing 5 of them back into the bag in exchange for a 5 VP chip when appropriate. Players may not count the chips in the bag. And for some people, that's the fun in a game, regardless of what the game play is "meant" to be. Let's say that a game gives me two opportunities: I can try to pick a black card from 2 red cards and 1 black card, or I can try to pick a black card from 99 red cards and 1 black card. I have a 100% chance of successfully choosing the opportunity that I want . There is no waiting for the results, no possibility of error, and nothing my opponent can do to prevent or overturn my choice. In a game of Chess, when I choose to make a legal move on my turn, there is a 100% chance of my move occurring. Between that move and my next move, my opponent may respond in many different ways. There is no skill I can exercise, no feat I can accomplish . All I can do is await the outcome. The difference between these two games is that in the former case, I await pure chance to determine the results, while in the latter case, I await the skills of my opponent to determine the results. In either case, I can be lucky or unlucky. Luck in picking cards is obvious. In playing Chess, luck may have to do with my opponent's mental state, somehow having hit a blind spot in his evaluation or knowledge, his having a weakness to which I played , and so on. Here's a third game: I'm shown the location of the black card in a set of three cards, and then I go read a book. Now I come back and have to remember where the black card is. I remember that it's not the right card, but I can't remember if it is the middle or the left card. I decide to pick one of those two cards. My choice is partially skill and partially luck . My skill has reduced the amount of luck. After my decision, I must again await the result of my choice. If I play the game a dozen more times, I will win every time - no luck involved. The first time I played, I didn't realize how hard it would be to remember. Or, perhaps, I hadn't yet come up with a workable mnemonic system. If the first game is luck, and the twelfth game is not luck, when does the game change from being one of luck to one of skill? After all, some people will win every game, even the first one; they have a natural skill. Some will always rely on luck. I determine from these questions that a) my skill can reduce the amount of luck, or eliminate it entirely, and b) beyond the reach of my skill there is still luck. A wild guess. Or an educated guess. A wild swing. The hope that my opponent will under- or over-estimate my play. If a game relies entirely on skill, it is a puzzle, or it is a foregone conclusion (e.g. tug-of-war with a baby). Assuming that I can evaluate the situation correctly, and assuming that my opponent can't cheat or otherwise manipulate the odds as I understood them. Roman's comment on my last post noted that, though my choice of a card is in fact irrelevant, human nature ascribes importance to the selection of the card; if the card is simply flipped at random, it doesn't feel the same as my "picking" a card. This is true, and a fact of human nature that good games exploit. Assuming that I cannot influence the decision through meta-game actions, such as trying to make him nervous. I could, however, use the opportunity to plan my next move. That can also be skill on my part, and not only luck; for instance, I may play moves quickly, thereby rattling him. Of course, it may actually be the right card, and I remembered incorrectly. My top twenty board and card game news items, and my top ten Eurogame news items, are both on Purple Pawn this year. Following Steve Jackson's other release +6 Bag O'Munchkins. Aside from the weirdness of using these in a game of Munchkin - you can put one in front of you in order to gain a benefit during the game - SJ added a whole level of weirdness to them by allowing you to use the pieces in any other game. For instance, you can whip out a munchkin babe to add or subtract from your die roll once in some other roll and move game. This is so cool, that I hope the concept spreads (and I'll be stealing the idea for my next game at BGG.con, so look in your goodie bags). Architecture in the stone age. One player is the architect who sees a card with blocks in a certain order. The other is the builder who doesn't see the card. The architect has to communicate to the builder using grunts and movements to tell the builder which blocks to pick up, rotate, and where to put them. If the builder does an action right, the architect bangs him on the head with a bludgeon. If he's wrong, he bangs him on the head twice. Based on the line from Return of the Jedi, this is a phrase-forming game using letter and punctuation tiles. From the BGG description: Players throw coasters onto a table. And then they get money. And then they throw more coasters. And then they get more money. This very complex and detailed process repeats until the end of the game at which point the player with the most money wins, just like in real life. At that point the winner will claim that Beer & Pretzels is the best game ever, and the non-winners (to be super politically correct) will claim that the game is fundamentally flawed, and most likely broken. The game based on the web site, in this game, you play a game company trying to sell your games, and you also play players at a game group trying to acquire the best games for their group. Designed by Richard Breese, the game features a thousand avatars from registered BGG users. You're a troll who throws boulders to attract travelers to cross your bridge. Half the travelers you rob for their money, and the other half you eat. This allows you to pay for repairs on your bridge. From the boulders you've thrown. Each player has to guide his dwarf to the bar to pick up booze and grub and then make his way back to his table avoiding trouble and piles of vomit. The hunter looks for the animals who casually saunter away, trying to convince the hunter that he must be looking for something else. While the hunter strolls through the forest, players try to look like an animal the hunter won’t shoot (waving their fingers over their head). A box with randomly arranged objects where the only way to find them is by putting mirrors into the box and looking through the sides. And since you're all vampires, if you find the objects, you collect blood tokens. A web-published redesign of Invisible City's Cthul-B-Que. Capture and cook Cthulhu Mythos monsters without losing life, limb or sanity. End the game with the most monstrous dishes in your serving area. A game simulating Russian Roulette with foam bullets. OMG. A print and play game based on Sid Sackson's games Doorways to Adventure and Doorways to Horror. You watch specific Youtube videos, looking for clues. Pick the dish you want to try to eat from the buffet, roll the dice and see if you manage to force it down or if you lose your lunch. Be careful not to eat too many different flavors and avoid gross food if you can while you race to victory. No information is given about the game contents, genre, or rules, and there is no rulebook. Part of the game is to discover how to play using the contents. A game with no components. The object is to describe the hand of cards you would have gotten, if you had actually been drawing cards. The best fictional hand wins. It's Life, but you might get married while skydiving or give birth to sextuplets. And it's published by Hasbro. Players become little anthropomorphic animals who try to charm sweet girls of wavering morality. Hamster martial arts. 'Nuff said. Bingo cards, where each space is an insult or vulgarity. Players take turns reading (shouting) the spaces, marking them off on their own card as appropriate. Navigate your way through the Mustard Marsh, cross the eerie expanse of Wiener Wasteland and sail on the Sausage Sea. If you make it past the deceptive detour of Vegan Alley and avoid getting grounded in Gristle Grotto, you might just make it to the Great Frying Pan at the end of the trail. A card game poking fun at MMORPG players. A poopsock is an item that allows a player not to have to go to the bathroom, thus avoiding wasting valuable level-up time. Your goal is to kill off your opponents' Star Trek security personnel. Of course, they all eventually die in the end. Players battle over creating a new version of the ten commandments. Each player has a different goal. The game comes with three cards. Pick one to find out if you win, lose, or banana. Our dear friends had a bar-mitzvah for their (4th? 5th?) son on shabbat morning. The BM boy read beautifully and then spoke very quickly. Shul was followed by a kiddush. I ran from the bar-mitzvah kiddush to the kiddush at another shul, where my wife gave a small d'var torah in honor of our dear friends who just finished walking the entire Israel trail, in order to raise money for ALS research. They completed the trail, and also (with 6 km to go) raised their target goal: $36,000, or $36 for each kilometer walked. The walkers all lost several kilos. They have a haunted look about them, like they don't know what to with themselves now that they're not hiking. You can still contribute, of course. The party for the bar-mitzvah boy takes place after shabbat (sometimes later in the week) so that there can be fresh hot food, gift giving, book signing, videos, music, and microphones. The father of the bar-mitzvah boy did the worst karaoke rendition ever of a U2 song; on the plus side, the IDF is looking into using his talents for riot control in the territories. The food and company was good, though. To the friend whose father's funeral we attended on Thursday. Rachel has banished my game collection from the living room closet to the shelves near the washing machine. I admit that they fit better there. But still. The collection no longer dominates the living room. Sniff. I didn't play anything this shabbat, but last shabbat I introduced some kids who love games, but are as of yet only familiar with mainstream games and with my game It's Alive, to Alice and Wonderland Parade (they liked it) and Lord of the Rings: the Confrontation (they loved it). They played ten games of LotR:tC, returning it to me the next day. From (One Person's) Bris to (Another Person's) Funeral. And a Play. On Rachel's first full day back, we went to a bris, a funeral, and a play. I reminded her that Jerusalem isn't like this all the time. But considering all of the other events that will occur in the next two weeks: two weddings, a bar mitzvah, New Year's, ... I'm not sure I convinced her. A day on which you go to a bris, a funeral, and a play, is not a day in which you can get much else done. From birth to death to performance. Rachel hugging the sister of the imminent amputee. Wednesday night we went to a birthday party for a Norwegian friend; most of the other attendees were Norwegian. 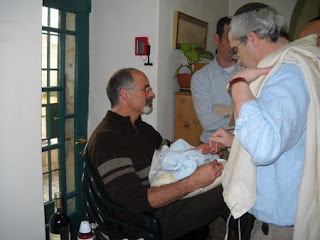 Thursday morning's bris was for a Swedish couple, held at the Swedish something-or-other on HaNeviim street, and most of the other attendees were Swedish. Though each of these friends are dear to us and part of our usual social circle, neither of the circles at the events contained many people from the usual social circle; in other words, it wasn't a "shul" or "neighborhood" event. The baby's three young, beautiful children all love Rachel, and had missed her while she was away. They always congregate on her lap in shul. 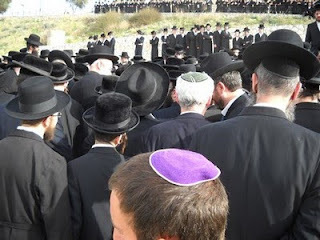 The funeral was for the father of another dear friend of ours, who was supposed to be the next Rebbe of a certain Hassidic sect, but declined the mantle because he considered himself too involved in the secular world (he had an influence on Herschel, for instance). Our friends are not Hassidic. 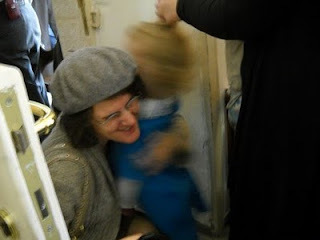 It was hard to get close to the graveyard to shovel dirt on one's own, but anyone who wasn't wearing Hassidic garb was assumed to be a family member, and so I (and the gray-haired husband of the one who lost her father, see below) were specifically ushered to the grave for this purpose. After the actual burial was completed, the women came down. 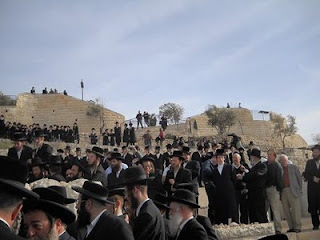 The separation of the sexes at a Jerusalem burial (even the daughter, wife, or mother must remain behind the railing) is not one of my favorite customs (nor is it required in Judaism, I believe, but Haredim control such things in Israel, and their customs tend to prevail). 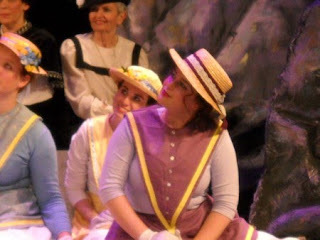 Tal is my youngest, 16 years old, who is somehow managing to perform in two plays (Pirates of Penzance, Another Antigone) and still keep up her schoolwork. I'm both stunned and proud. PoP runs again next week on Tuesday, Wednesday, and Thursday, and is well worth the exorbitant ticket price for an amateur production; it's the best show I've seen in Jerusalem, excepting an amazing Shakespeare productions that I saw last summer in Jerusalem's botanical gardens. 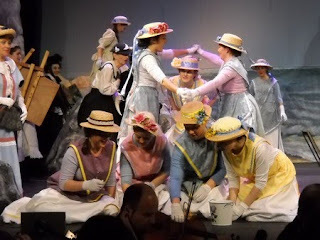 It has a lovely live orchestra and excellent singing. And it's Gilbert and Sullivan, of course. The latest Jerusalem Strategy Gaming Club session report is up. Games played: Phoenicia, Atlantic Star, Alice and Wonderland Parade. First play of Phoenicia for four of us, first play of Atlantic Star for two of us, first play of Parade for one of us. Rachel is returning tomorrow, God willing, for semester break. Over the next two and a half weeks, we're scheduled to attend two weddings, a funeral/shiva, a bris, a play, a bar-mitzvah, one or two sheva brachot, a shul shabbaton, and God knows what else. Oh yes, a birthday party. Moon: It's a lot like Solaris. Both were intelligent movies for grown ups, with similar plots. Broken Flowers: Not bad, but doesn't go far enough to sustain an entire movie. Julie and Julia: Amy Adams is fetching, as usual; Meryl Streep is brilliant, as usual. They prettied up the less-palatable real life of the protagonist. Knowing: Typical Nicholas Cage, typical plot loopholes in a sci-fi disaster movie. 500 Days of Summer: Zoey Dechantel is fetching, as usual. A decent, but not fabulous, romantic comedy. This post lists new (to me) blogs since my last roundup, which was around three months ago. You may also want to check the sidebar on my blog to see if your blog was dropped from my list, which it was if it has not been updated (or contained no game postings) in the last three months or so. 2d6: A staff of people doing video reviews and interviews. 2p Co-op: Alan and Gillian from the UK. Beginning gamers player two-player games. Board to Death TV: Michaela and Steve, Montreal. Video reviews. EdGames: Students of EdTech 670 course. All about everything having to do with games. Endless Bag Of Dice: A 25 year old guy with the pseudonym MKay, Helsinki, Finland. Mostly RPGs, but promises to get more board game material in. game thought: Nolan Lichti, Indianapolis, IN. Thoughts on games, but I don't know how serious a blogger. Geek Pride: Ethan Gilsdorf, Somerville, MA. This blog is on Psychology Today's site. Pop culture, mass media, and gaming. MetaGames: James Sheahan, Guilford, UK. Mostly reviews from a consultant. Strategos Utopia: News from a board game store in Indonesia. The Board Game Family: Trent Howell, UT. Reviews, text and video. The Board Game Nut: Kevin Michaelis, West Valley, UT. Reviews from a hobby business owner. The Word From the Outpost: Darren Johnson, Glendale, AZ. Industry info from a game business owner. The latest Jerusalem Strategy Gaming Club session report is up. Games played: Hare and Tortoise, Cuba, Amyitis. First play for all of us on each game. First looks at Hare and Tortoise and Cuba. eLuna.com is a fantastic, invaluable web site. The site contains a large list of kosher restaurants around Israel, and offers - for free - 10% discount vouchers for nearly all of them. You can also pre-pay for vouchers with even better percentage deals, or bid on weekly auctions for vouchers with yet even better percentage deals. I've bid on numerous auctions and won dinner for 300 NIS paying only 200 NIS, which is amazing. Bidding is free. If you win an auction, you pay a 10 NIS service charge to eLuna, which I factor into my bid price. Suffice to say, eLuna has saved me hundreds or thousands of NIS, gotten me out of the house more (canceling some of those savings :-) ) and introduced me to many tasty restaurants that I never would have tried. The only real problem that I have with the voucher system is that, other than the 10% vouchers, the pre-paid or auction vouchers can take a few days to get to you, sometimes up to three days. Which means that you can't pick where you're going for dinner and get a pre-paid voucher for that evening. Or pick where you're going on Thursday night, win the auction on Wed night, and hope to get the auction voucher by Thursday night. It can sometimes take them until Sunday before they send you the voucher. The vouchers have a limited lifetime; you have to use them within two or three weeks. One other minor problem is that they don't include a telephone number on their site. They include a fax number and an email address, but they're just as likely to take two or three days to answer an email, by which time the voucher that I thought was lost will have arrived. Until now, this has not been too much of a problem. Last Wed I won an auction voucher, dutifully paid for it when I got a message indicating to do so on Thursday, and expected the voucher by Sunday, at least. Since I was going to Tel Aviv on Thursday (tomorrow), and the voucher was for a place in Modiin (on the way to Tel Aviv), I had to have it, at latest, by Wed evening. The voucher didn't come by Tuesday. Tuesday at 12:10 pm I sent an email to eLuna asking what the deal was, and that I needed the voucher by Wed at the latest. The voucher didn't come by the afternoon. So I sent a letter to Janglo on Tuesday afternoon (4 ish), asking if anyone had a telephone number for eLuna, complaining about the delay, and expressing my annoyance that the contact info was not on the site. Several hours later I received the voucher from eLuna. I responded with thanks, and told them next time not to take six days, or to at least send me some kind of communication in the meantime if they are having technical problems. They apologized and offered to call the restaurant if I have any trouble with the voucher due to any expiration problems. On Wed (today), someone sent them a copy of the post I sent to Janglo, and they were rather upset that I chose to malign them in public. They have asked me to issue a retraction to Janglo, which I have done, but I don't know yet if Janglo will post it. - I should have emailed eLuna on Sunday or Monday, and not waited until Tuesday when time was now pressing. Perhaps they would have seen my email and sent me the voucher earlier. In any case, by waiting until Tuesday to deal with it, I put myself into a situation of desperation and frustration. - I should only have emailed to Janglo a request for contact information, WITHOUT mentioning the problem. Though what I wrote was accurate, there was no reason to share my frustration with Janglo. Janglo readers never heard from me after the many, many times that things went well with eLuna, so by sending a complaint, I did not paint a complete picture. Now I'm rather sorry that eLuna has to deal with a couple of emails from people asking what the deal is (spurred by my complaint) and I can understand their being upset with me. Not that this didn't start with something that they did wrong; it did. But I didn't handle it properly. To show my appreciation for eLuna, I'm hereby letting everyone know that eLuna's a good site, with great deals and great information. I use it a lot, and I would recommend that anyone else in Israel looking for a kosher restaurant use it, as well. Dinner at Nadine's. I brought Tribune. It supports up to five players, and is fairly easy to understand. We played with Beth, a longtime friend of Nadine's from LA who comes from a gaming family, and I-can't-remember-her-name-but-Nadine-will-in-the-comments, a friend of Nadine's son who just made aliyah. She is not a gamer I think, but had no problem learning the game. In fact, Tribune goes very smoothly if there is someone around to teach the game. The game narrative is very straightforwards, but there are all these little niggly things to remember. Even though these are all printed on the cards or player boards, they're not so easy to remember, anyway. Everyone enjoyed the game, and we also all saw the potential for getting better at it as we learn how the mechanisms interact and can make particular choices as to which paths to take. And begin to make our decisions based on what others are doing. So it looks like a keeper. We played a medium game, and Nadine was the only one to get the victory condition. Beth was one coin away (29 instead of 30). I was one faction marker away, which is not quite as close. Saturday night I had a Hanukkah party. It was supposed to be music and a game, but nobody brought music. In one corner, Nadine taught four others how to play R-Eco. Later, the whole group played a Hanukkah Jeopardy game that I made. Since our group is fairly knowledgeable, I tried to make it a little harder than the usual "on this day of the month of Kislev is the holiday of Hanukkah". My questions were more on the order of "this was Antiochus' second in command, who dispatched the Greek/Syrian armies to Israel". And the group managed to answer correctly 80% of the questions. Details about the answers/questions are available upon request. The latest Jerusalem Strategy Gaming Club session report is up. Games played: Alice and Wonderland Parade, Dominion: Intrigue, Magic: the Gathering, Homesteaders, Tribune. Nearly all new games brought back from America. There are two distinct aspects to board gaming; so distinct, that they aren't the same activity at all, though they look the same from the outside, and most games package some combination of them into the same box. These are: luck and strategy. Passive and active entertainment. Watching and performing. It's no crime to enjoy both. Moods vary, depending on the lateness of the day, alcohol consumed, and other factors. When you roll the dice and laugh, groan, or jump for joy at the outcome, you are enjoying passive entertainment. Your having to push a button to cause the random event doesn't change that. The entertainment value is from seeing what happens to something outside of your control. Like watching television. When you're called upon to think or make a decision, you are enjoying active entertainment. There are different levels of active entertainment, from the simple (trivia: do I know it or not?) to the complex (how do I get my battalion to that base?). Regardless of complexity, you can rank better or worse players, and most of the time you can work to improve yourself. You can't rank or improve performance of experiencing passive entertainment; the participant isn't performing. Obviously the writers of this article had expectations that games are there to amuse the players while the players watch. That's fine, if that's what they like. Unfortunately, they didn't realize that watching games play out is a different sort of entertainment than performing them. I'm sure that they would diss Chess as too boring. My friend David pointed out this article about a division within active gaming: performing vs mastery. There are two types of activities within active gaming: performing what you know well (relishing an easy win), and mastering what you don't (struggling, failing, and eventually succeeding at a difficult win). The article is a good read. The author claims that, while in action games, the player must improve in order for his or her performance to improve (mastery), in RPGs, the player's character gains performance disproportionately to the player's actual mastery. It's like: see what skills you've gained, though the player hasn't really achieved any new skills. I think that's a little unfair to RPGs, especially the ones that require actual player thinking. But mostly because RPGs are simulating a different type of fantasy: real players shouldn't have to get more physically fit for their characters to become more physically fit. But the general point is sound: people play games for different reasons, depending on what types of entertainment or recreation they want at a given time. Ranking different types of games against each other is pointless if they are meant to provide different types of entertainment. Five of us played Alice in Wonderland Parade and Vegas Showdown. Not having been to Essen, I didn't have a copy of Parade, but it was easily made from my Sticheln deck. I'm pretty sure I got most of the rules right; I wasn't sure what happens if two or more players tie for most number of cards in a color. Do they all get the reduction, or none of them? We played that they all did. Fun game. Elegant rules. It took some a while to grasp the implications behind the rules. They kept trying to assess which cards were better or worse, and the answer was always "depends". The most common physical activity was pointing at the line of cards and counting them. Nadine won the first game, 6 points to my 8. Mace triggered an early end game by having each of the colors. Mace won the second won with 9 points, to Ksenia's 11. Nadine totally hosed me in the second game, and I repaid her in turn, taking us both out of contention. Vegas Showdown was also a good game, as usual. I'd played before, but I still didn't feel like I knew what I was doing. Ksenia and Shirley each tied for first place (Shirley had the tie-breaking cash). I'm invited out for dinner, and I made lunch: roast potatoes, noodel kugel, veggie cholent, cheese, bread, wine, salad, apple pie. Gamers are coming for lunch, so I expect to play something after. Maybe I'll bring something to dinner, too. I think I'll create an Alice in Wonderland Parade deck out of my Sticheln deck, until I get a real copy. I woke up at 11:00, shabbat is at 4:00 and I'm just shy of being overwhelmed. The latest Jerusalem Strategy Gaming Club session report is up. Games played: Dominion: Intrigue, Dominion: Seaside, Tichu, Le Havre, Pillars of the Earth, San Juan. First plays for both Dominion expansions and for Le Havre. I forget that my blog, Twitter, and Facebook accounts aren't a single entity; yes, I'm back in Israel. Saturday morning Rachel spoke before davening at a small service whose name I forget, while I davened at Shaarei Shamayim, the large modern Orthodox central shul. I sat down, in a huge sanctuary in the back, and asked the guy next to me to take me to the secret kiddush club. Naturally, there was one. Secret Kiddush clubs are usually during, or after, haftorah and serve Scotch (and the like), herring (and the like), soda, and crackers. At least, that's what I got at all three secret kiddush clubs that I've been to. Rachel and I then walked to Beth Tzedec, a vast Conservative synagogue, where she gave a lecture after their kiddush, as well as another one later after Mincha. A little disconcerting to me to see and hear the occasional person with a cell phone. And there was a microphone available, which Rachel didn't use, of course. Though some guy asked her to use it, refused to move forward when she wouldn't, and then got up and left two minutes later. Meals were arranged, and were lovely. And unlike every household I was in in America, no one (except my father in law) had a vast big screen TV dominating the household, and no one talked about sports. Saturday night we went to see old friends of hers, the Weinrebs. Later that evening, I tried to do online checkin for El Al, only to have my ticket number refused. A call to El Al revealed that they had secretly changed my ticket number, again. The new one worked. No further problems for that flight, thank goodness. Except that it was a 767, which didn't have personal video screens. Movies: Post Grad (girls can't find a job after college, and when she finally does, she quits it to be with her boyfriend, the end), Stone of Destiny (Scottish nationalists steal a rock from the English and then let the police take it back again, the end), The Edge (Guys get lost in Alaska wilderness and try to make it home in one piece; decent, but formulaic). I wish I could sleep in airplanes. Home sweet home. Kids, dog, mail, clean, food, work, sleep. Toronto is old hat to me, I guess. Other than a brief trip for Chinese at Golden Chopsticks (ok, but nothing amazing), Cafe Bistro with Rachel (very nice dairy), and to pick up some games, I've been inside, working. Rachel is scholar-in-residence one more time, this time at Beth Tzedec, a big Conservative synagogue. She also did two gigs on Wednesday and was interviewed for the TV show Israel Today this morning. I'm "her husband" again. Maybe the only thing amusing that I saw was on a bus: the bus driver was driving, and behind him was a Plexiglas barrier, and, behind the barrier, a bus supervisor was standing. On the barrier was a sign that read: "We stand behind our bus drivers." Ha ha. Ok, not much happens in Canada, you know. The latest Jerusalem Strategy Gaming Club session report is up. Games played Galaxy Trucker, It's Alive. First play of Galaxy Trucker for everyone, I think. Next week back at my house. I ran a game at BGG.con which I called Zauberenhändler, which I hope means Wizard Trader in German (that's what it was supposed to mean). There were 1000 cards, 10 identical copies of 100 different cards. The 100 cards contained a) a name, such as "David", which is the person represented by the card, b) an age relationship between two other people on two other cards, such as "Claire is 26 years older than Gwen", and c) a bonus that may be absolutely applied ("add George's age to your final total") or conditionally applied ("add +20 points for each person whose name begins with the letter "G"). The rules to the game were printed on the back of each card. Each of the 100 people had a unique age between 1 and 100. Each player received one card. Players were told to trade and collect cards. By Saturday evening, they may hand in to me up to five cards, with no duplicates. Their score is the total of the ages of the people they hand in, plus any applicable bonus scores. Top three scores win prizes. I received several thank yous from happy players and non-players alike. Some began playing and then passed their cards on to others, but still enjoyed the idea. Some enjoyed watching others play. One couple took the game very seriously and traded candy and chocolates for cards, amassing some 350 cards by Saturday night. They spent several hours trying to create perfect sets. He and she came in second and third place. A friend of theirs came in first. The game, as usual, enhanced social interactivity, which was really its entire point. Jon Theys helped clarify the bonus values and text, added a graphic, did all the production, and even wrote an Excel program that let me simply select the card names to find the total. Awesome. I enjoyed creating the game. I was expecting that this game would be much simpler than the previous game, because there was only one type of puzzle, and only a hundred cards and ten copies of each card. I also figured that, by the time any one person had amassed 40 or 50 cards, the ages of all of them would be pretty much known, and that this list would propagate to any other interested players. All that would be left was physically obtaining the cards and calculating the maximum bonuses. So I was slightly worried. Turns out I should have run some computer generated runs. The couple who had amassed 350 cards only had 70 or so unique cards, but even from that could not figure out the exact ages of nearly anyone. This drove her entirely crazy. I realize that I made a mistake of not putting any base ages in; however, I did put in a few "X is times as old as Z", which should have acted as bases to help you find sane age values. When I learned of her frustration, I realized that she was going to keep calculating until she had "solved" the game. I also immediately realized that this was simply not necessary. All that was required to do was take five cards and make your best educated guess. The more information you have, the better your chances of guessing well. If you can't figure out the entire table, at least you have a good idea as to whose ages are relatively higher and whose are relative lower. And you know: this is even better. I thought it would be too easy, and it turned out that finding all the information was difficult. Difficult, but not necessary. The three people who won were the three people who had spent the most time making the best guesses that they could. And that's exactly how it should be. Unfortunately, fewer people that I hoped actually turned in any cards. This bothered me, of course. Then the complaints rolled in. This from gamers who spent four days pouring over 40 page instruction manuals and went seeking any of the dozens of available game teachers to teach them how to play. For some reason, they couldn't understand a single sentence on the back of a card, or be bothered to ask an administrator what it meant. I have no sympathy for you. What exactly do you expect in your game bag at a game convention from a game designer? A lottery ticket? You already got three of those. I can't stand lotteries, which is why I don't play games with dice. If I make a game, it's going to have something more than a random drawing. Don't like it, don't play it. I'm nearly as unsympathetic to this one as to the previous one. Haven't you played Settlers of Catan? And you don't understand what trading is? Maybe the rules were too short: "Trade and collect these cards." It seems I should have added more: "You may trade the cards, give the cards away, use them as ante for another game, give them or get them in exchange for candy, beg, borrow, or steal them. Just try to amass five good cards. To know if cards are good, you are going to have to trade information with other players or collect a crapload of cards. Good luck." Honestly, I thought this was implicit in the rules. I guess others didn't think so. Next time, I will make this explicit. Continuing with the previous criticism, a number of people were in despair of playing because they only got one card; how were they supposed to get five? See my answer to the previous complaint. I sympathize with this one a little more. Mischa explained it to me. It would have been better to give a bunch of cards and ask for a bunch of cards, like I did the first time. For several reasons. First, having multiple cards gives players a better idea of how the cards vary, and so what they can expect to find if they trade with others. Second, it is not so hard to get a few cards when everyone had several, while it is hard to get four more cards when everyone has only one. It didn't help (though it's slightly amusing) that Alex Dupres was discouraging other people from playing by scorning them if they only had one card and then happily taking it from them when they decided not to play. Heh. You did play; you just lost. But lesson learned: next time, each player will get multiple cards. As I mentioned above, that's not a bug, it's a feature. You didn't have to solve the game to win. Getting clues and a general idea was enough to win. I sympathize with your OCD, but I'm laughing at you, too. Yeah, sorry about that, but all the admins knew that I would be away Friday afternoon until Saturday evening. Some of them didn't know that they could collect cards on my behalf; I'll ensure that that doesn't happen again next time. For those of you who didn't know who I was, you just had to ask. The admins knew me, as did around 100 other people walking around. And I was the only one with a kippah on my head. Maybe I'll put my profile on the cards next time. I wish I had known them before, too. Putting them on the cards would have been a good incentive to play. All the complaints are being taken into account, and my third version will hopefully build on the positive aspects of the first two. It will be back to a situation where you don't have to solve anything to make a best guess, and you will receive multiple cards. I'll add more explicit rules, a little about the prizes (if possible), and how to find me. I'll make sure the admins stand in for me when I'm not around on shabbat (or if I don't come to the con, I'll ensure that they know how to handle this). I may put up a box for submissions again, like Aldie did the first year. And I will try to ensure that the game makes its way into the official con schedule listing, so as to give its presence, and the rules, wider exposure. The latest Jerusalem Strategy Gaming Club session report is up, quite belatedly (last Wed's). Games played: Fluxx, Year of the Dragon, Shadows Over Camelot, Notre Dame, Vegas Showdown, Tichu, Puerto Rico. Many people appear in the session report whose names I don't know. Go Nadine. Tickets have a ticket number (14 digits) and a record number (6 letters). You generally use the record number to do automatic check in, though you can use the ticket number as well. My flights were/are El Al Tel Aviv to Newark to Cincinnati, American Cincinnati to Dallas to Toronto, and El Al Toronto to Tel Aviv. It is also worth noting that my ticket is under the name "YehudaJonathan", since my Israeli passport is Yehuda and my American is Jonathan. Generally this causes no problem. I bought my ticket in June, and my travel agent reissued the ticket in July, with a different ticket number and the same record number, though the old record number was not printed on the new ticket: instead there was a "reference number", also six characters long but containing both numbers and digits. I only discovered this the night before I left; I tried to check in online with El Al using my old ticket number but the old ticket number was not recognized. I quickly got the new one from my agent and successfully checked in for my flight. I had both the old and the new tickets printed out in my bag. No problems getting through to Cincinnati on El Al/Delta. And no problems getting from Cincinnati to Dallas using the original record number. When I tried to check in in Dallas, the record number didn't work. Rather, it worked but it was associated only with the old ticket number, not the new one. Therefore, the counter agents at AA could only tell that the old ticket had been changed to something but they had no idea what, or even with what airline. The Cincinnati to Dallas one did not suffer this problem because it was a separate leg of the trip, not associated with the El Al portions to and from Israel, and so remained under the original ticket number. Though why they let me check through two bags for free when traveling from Cincinnati to Dallas remains a mystery. I gave them my new ticket as well, hoping this would resolve the problem. However, the AA ticket agents looked at the "reference number" on the new ticket, said that this isn't a valid "record number" for AA, and so this printout only applies to my El Al portion of the trip, not the AA portion. They never bothered to actually enter the new ticket number to check that. I didn't catch this; I thought they also checked both old and new ticket numbers, but I didn't insist on it. They also were not able, for a reason that remains mystery number two, to find my new ticket using my name and flight number. When I called AA today, they told me the ticket number they had associated with the record number and told me to find out what happened at El Al, since there was nothing they could do for me. Contacting El Al, they said that there was nothing wrong with the ticket, and was I sure that AA had used the correct ticket number. That's when it began to dawn on me that maybe they hadn't. I called back AA, explained the story again from scratch to a sympathetic service rep, and we found the new ticket. Turns out that AA had assigned a completely different record number to the new ticket number, a record number that is entirely different from the original record number that El Al and my agent continue to associate with the new ticket. Mystery three. Naturally, that ticket showed me as a "no-show", since I booked it but didn't use it. Of course, since I had bought a third ticket and used that, instead. She told me to go ahead and ask for a refund using their online refund system, explaining the story in the appropriate text field. It sounded like they were ready to refund the ticket and just had to fill out the form. Unfortunately I hung up to do this, only to discover that the online form refuses to even let you ask for a refund if the ticket was issued as non-refundable and already used. Instead, the online form told me to call AA customer service if I needed further assistance. Call rep four, who's overly sensitive and less sympathetic, and also, over the course of the next half hour ask me multiple times for the same information as her computer keeps crashing and she neglects to write the information down on any note paper, which is what she should have done the second time she asked me. But after many minutes of holding and questions, she verbally assures me that they have gone ahead with the refund. She offers me no written, faxed, or emailed confirmation of this, but says I should be able to see this online once the refund enters the system. So I thank her and hang up. It's now 9 hours later and I still don't see the refund in process online, but I'm hopeful. I just spent a half an hour arguing and pleading with American Airlines to give me a discount after they lost my ticket Dallas to Toronto. They said it was my agent's fault for changing something; they could see my name there, but there was no longer an associated ticket. I had to spend $1200 for a new one way Dallas to Toronto, which is as much as my entire ticket from Israel to and around the US and back. The AA reps at the gate refused to help me, except to blame my agency (closed in Israel, as it is after hours, and I couldn't find an emergency contact number). They said that if they did something to help me that was against the rules, they could get fired. One of them went on break while she was supposed to be helping me, and the other one looked at me like I was nuts when I asked if she could call the first one back from her break. My taxi ride from the Westin to Dallas proper ... or, I should say, one of my taxi rides. I forgot to mention the several times that I played Tichu, one of which was pretty epic. We decided to play to 500, after our opponents got 300 on the first hand. In the next hand, my partner (playing for the second day of his life) called Tichu, and was having a difficult time making it. My hand was filled with high cards and various low pairs. Every time I led, LHO overtook my card and partner couldn't overtake that. I overtook LHO and had to lead again. I broke up every single pair in my hand and was working on all the low singles before partner finally got in and was able to play out his Tichu. And my last hand I made Grand Tichu. I recall it was also some tricky playing, but I no longer remember what. We won by 20 points, 560 to 540. The trip to Dallas by taxi was as expected. We didn't take George Bush highway, which is a good thing because although the highway says that it goes to Dallas, it actually ends about a third of the way there at a sign that says "Mission Accomplished". And then goes over a cliff. I got to spend about ten minutes in a smaller Half Priced books (picked up my third trilogy from Julie Czerneda), and finally got to blog. At the Geekbuzz station. BGG.con is now wrapping up and I'll try to help clean up, get a ride to Dallas, hit 1/2 Priced Books, and a bridge club this evening with David. Then to Toronto tomorrow. Played Time's Up (a expansion about titles) - it's a party game, hard, but fun. Played a game whose name I can't remember with Chris and Jim: nice, I'd play more times, but not deep enough for the group. More on it later. Played an abstract game of demolishing and building towers with Mischa. Very abstract, very solid, decent filler. Again, more later. Played Infinite City: it was a so-so tile laying game, fans of chaos will like it. I didn't like the constant back and forth, making planning near impossible (though I toasted the guy demoing the game to me 26 to 16). I thought it would make a nice CCG, like Chizo Rising. Listened to the demo guy explain the rules to Homesteaders, and combined with that and that Alex Rockwell designed it and he likes what I like, I bought it. Also traded my copy of Carpe Astra for Sumeria. That's everything. Oh yes. I also got to hand out the three prizes for the trading game I created. A number of people thanked me, many complained that finding information was too difficult. More on that later, too. Rachel was scholar-in-residence, and I was "her husband", for shabbat. We stayed with and ate at lovely people's houses, but I felt a little out of place; most of the conversations were about sports, business, Republican politics, drinking (which I don't, much). But they were great people, served fantastic food, and had large, beautiful houses. Saturday night I made it back in time to catch some of the Golden Geek awards (Pandemic and Dominion each won something), skipped the grand prize giveaways (having given Mischa my ticket), and started making myself visible to collect entries to the wizards trading game. I also played a game of Time's Up - it's a party game, but it's pretty challenging. And Tichu - at which I played epically; I'll write more when I'm not at a public computer. More games I forgot to mention that I played on previous days: Mah-Jong for the first time - man is that a wacky game. If you know the strange conventions of Cribbage, it's times 100 more than that. Special ways to place tiles, move tiles, pick tiles, and hundreds of unrelated hand types you're looking to meld. You have to devote some time to understand the game. I also taught, played, and then sold a copy of It's Alive. Speaking of selling, Mischa also sold off two more copies and my El Grande expansions for me at the flea market this morning while i was away. Mischa has been my angel at this con, like he was the last time I came to the con, too. And I played Crokinole, of course. Rachel dropped by briefly and headed to the Day's Inn where were staying. I'll stay a little while longer to collect more game entries and then join her. Rachel is scholar and residence in Dallas this shabbat (not a coincidence). She landed in Dallas at 1:00, at the same time that I found my good friend Chris Brooks. Chris let Rachel crash for an hour in his room, and then I introduced Rachel to Aldie, Derk, Mischa, and Ted. Then the shul Rabbi picked us up and drove us to our hosts. Dallas has a lovely Jewish Ortho community and it's growing. Tobago: An Essen game, this is a neat game, light but doesn't feel insubstantial. You play cards that narrow down the possible locations of treasures on an island, and then you run to pick them up, splitting the values between the clue providers and the picker upper - but not simply splitting. I will write a lot more about it, but I enjoyed it, nearly completely. It had one irksome mechanism, which is the one where you can collect tokens that give you extra turns, and then spend them all at once. Not a good thing. But a minor problem, and easily corrected. Dominion Intrigue x 2: Only DI cards, and I learned to hate the Saboteur (and won against it anyway, so there). I won one, and lost the second. Prototype 1: I'll fill in the guy's name later when I find it: he's from New Orleans, and the game was like hex using d4s, where you kill two nearly adjacent d4s by putting one equally their total in between them. The game was flawed, unfortunately, and the designer agreed with me. Triumvirate: A small self-published game, I wasn't thrilled with it, though I only played a third of a game - it felt longer, though it was only 15 minutes. The problem is that it was very repetitive. I also felt like I got screwed with luck, but recognize that I may not have played optimally to counter the screwage. You might like it if you're looking for a light card game reminiscent of a trick-taking game. Prototype 2: Micha's prototype, the game worked, at least, but there were some physical problems to work out, and I'm not enthused about the game play, yet. But it's mature enough that I think it could work out. I'm hoping to give him some constructive feedback on Saturday night. Also, I forgot to mention yesterday that I played Age of Scheme, a fairly clean train + stock + merger game, not as frustrating as some similar efforts (where you cannot catch up if you're screwed), and it plays fairly quickly, too. The name is a deal-killer, however. It was remade into something sensible, I believe.